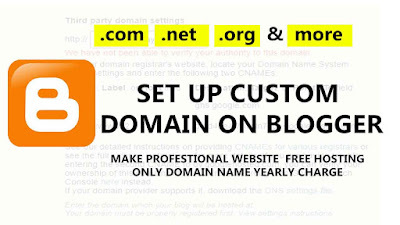 Hellow freinds, Today i am going to tell about how to link your custom domain like .com/.net. org...........(Premium) on your blogspot blog/site. You need to custom domain if you are planing to grow your business by blogging, business as profestional , people will believe to paid domain. In this method you need to buy only domain name, google will provide free unilimited hosting for your blogpsot blogger platform. which is developed by google. you need to buy third party domain name to redirect and setup your custom domain from domain provider company. if you buy your own domain name you can set up your own domain on blogger free of cost. if you have a already created own blogspot blog, let's follow my few step how to setup/link custom domain on your blogspot site. * Then, you need to creat own blog using your email id from blogger.com then creat new blog , type name and choose your own .blogspot url to creat a blog. choose a theme which you like. and creat blog. if you have already created blogspot blog, follow next step. * Goto Setting, then click on Basic, you can see there Blog Address(example : yourname.blogspot.com). now click on Set up a third-party URL for your blog . * Then inter domain name you Bought (www.yourdomain.com) and save it. Now you can see there warning this "We have not been able to verify your authority to this domain. On your domain registrar's website, locate your Domain Name System (DNS) settings and enter the following two CNAMEs"
* This error is minor because we have not connected our domain name with this blogger, here you can see www(name) hosted, destination, target you need to fill this data on your domain account pannel at dns management option , now sign in to your Bought domain account and goto dns Management option. and click on Manage DNS. * Now you can see there Records menu. both all all menu we need to fill data on to menu which are CNAME RECORD & A RECORDS , whcih was provided by blogger. add www on host name and add ghs.google.com on value. you can set TTl code as 14400 and click on add record. *after adding this host now again click on Add Cname record . You need to add 2 cname record on this pannel. Now pot label code on hot and long http://yourcode.googlehosted.com on value then choose Tlt as first steep same and click on add record. here we need to add 4 ip adress of google. now click on Add A record. put 216.239.32.21 in Destination IPv4 Address TTl value is 14400 and click on add record . *Now you Dns setup is complete. go to your Blogger Third party domain settings and save it. if save fails try again after few minute, after few time your setting will save. dont forget check (tick mark) on redicect. and save it. you can also Tuo\rn on HTTPS mode for your blogger for secure its completly free. after few hour your blogspot domain blog url will redirect at your custom domain name.